Attention, metalheads! It’s time for another metal chick of the month here on yours truly The Headbanging Moose, and this month let’s pay our humble tribute to an up-and-coming singer, pianist, composer and actress that truly knows how to blend the heaviness, madness and rage of Heavy Metal with the delicacy and feeling of classical music. Known for her powerful voice and incredible range, she’s the frontwoman and founder for American Hard Rock/Symphonic Metal band Edge Of Paradise. I’m talking about Margarita Monet, or Margarita Martirosyan if you prefer, born on February 15, 1990 in Yerevan, the capital and largest city of Armenia as well as one of the world’s oldest continuously inhabited cities, but who has been living in the United States since she was 11 years old. Margarita moved from Armenia to Moscow, Russia at a very early age with her family, where she lived for about 10 years, starting music lessons at the age of four and quickly accelerating into a competitive and performance-ready pianist, competing and winning awards in numerous piano competitions. When she was 11 years old, her father (who is a scientist) got a job offer in Houston, Texas, in the United States, meaning her life was going to have a huge impact in regards to lifestyle and mindset. In Houston, she attended The High School For The Performing and Visual Arts, for musical theater, moving to New York shortly after where she got accepted into New York University’s Tisch School Of The Arts, majoring in Theater at the Meisner Studio and minoring in Music. While living in New York, she acted in off Broadway plays, independent short and feature films, and sang with local bands at the city’s clubs. In addition, as a teenager, Margarita used to go back to Russia during the summer seasons and did some performing and recording with concertos, being known within the community of people who follow classical mostly from competitions in the country. It was in 2010 when our red-haired diva had another significant move in her life, heading to Los Angeles after getting interest from various acting agents in the city. Just a week after arriving in Hollywood, Margarita already joined a singing and dancing group and recorded on their album Angels De Amor, going solo after various live shows with that group. 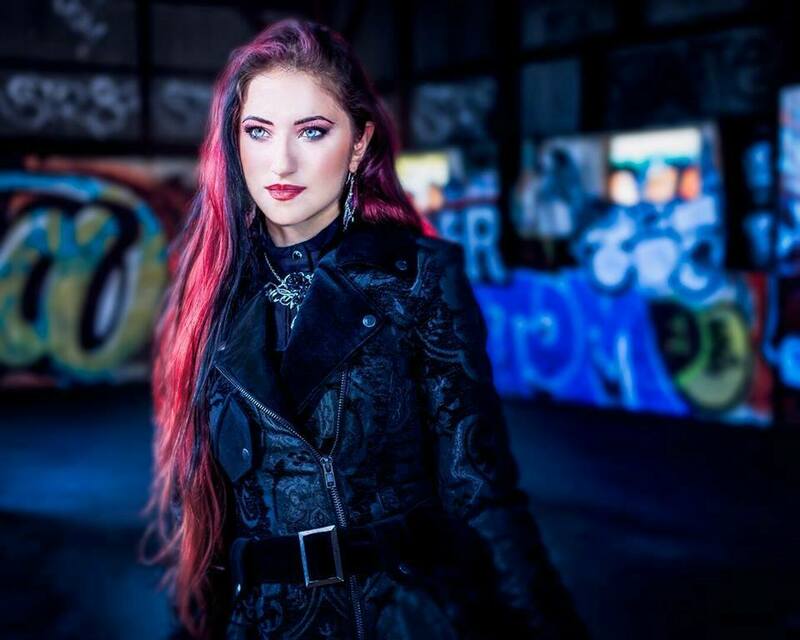 After going solo and starting working on original material for her first solo album, she met guitarist Dave Bates, who was in search of a singer who could replace Irish rock vocalist Robin McAuley (McAuley Schenker Group, Survivor) in their project named BLEED. Soon their music partnership created tremendous results and solidified the band that took up the new name, Edge Of Paradise. With Edge Of Paradise, which by the way is the official band of Nashville Knights, a women’s American football team of the Legends Football League (LFL) based in Nashville, Tennessee, and part of Rockers Against Trafficking (a foundation created by Kevin Estrada to raise awareness about human trafficking), Margarita released their debut album Mask, in 2011, featuring a rhythm section consisting of Gregg Bissonette on drums and Tony Franklin on bass (coming in at #6 most added on national CMJ radio, right behind Machine Head and Five Finger Death Punch), the EP Perfect Shade Of Black, in 2013, the full-length Immortal Waltz, in 2015, co-produced by Bob Kulick (Kiss, Motörhead) and Michael Wagener (and coming at #12 on national rock and metal radio charts), and the six-track EP ALIVE, in 2017. If you want to get a fun and pleasant overdose of the gorgeous vocals by Margarita, go to their official YouTube channel (or their VEVO channel as well) for songs such as Mistery, Dust To Dust, Shade Of Crazy, Rise For The Fallen, In A Dream, Break Away and Perfect Shade Of Black, or even for some treats such as their cover versions for Darlene Love’s 1963 song Christmas (Baby Please Come Home), The Nightmare Before Christmas’ Sally’s Song Black Sabbath’s masterpiece Children of the Sea, Margarita’s voice-and-piano version for Scorpion’s all-time classic ballad Still Loving You, or the band’s live performance of the song Ghost at the Soultone Cymbals Studio in 2016. Thus, after listening to her stunning voice in all those songs, you’ll quickly understand why she was featured in Metalholic’s “Top 25 Women in Hard Rock and Metal” in 2012. Furthermore, as aforementioned, apart for her music career Margarita also has an acting and screen background going back to her New York days, including a part as a dancer in the 2009 short drama Alicia, playing a character called Amy in the 2010 action movie No Leaf Clover, and portraying an illegal prostitute in the 2011 documentary Nefarious: Merchant of Souls, all under her birth name Margarita Martirosyan. Now with Margarita dedicating a huge share of her time to Edge Of Paradise, it’s uncertain if we’ll see her again on screen, but at least we can rest assured the band will keep shooting videos for their songs, which means more Margarita for our avid eyes and ears. When asked about her biggest idols in beauty, fashion and music, Margarita provided some interesting and beyond awesome names in all fields. Her inspirations in the modelling and fashion business are first Audrey Hepburn, who she has admired since she was a kid due to her feminine, classy and effortless look and style, and also Doro Pesch and Joan Jett due to their edgier styles. When it comes to music, her list of icons is even more impressive, with unparalleled names such as Ronnie James Dio, Robert Plant, Bruce Dickinson, Rob Halford and Freddie Mercury being her favorite ones due to their distinct and timeless sound, as well as their emotion, attitude and conviction when singing and performing. Margarita doesn’t see herself as a fashion and make-up junkie, but more like a “creative junkie”, meaning that because of her role with Edge Of Paradise she always strives to create something different and attractive for the fans, leading her to experiment with different looks, and having the freedom to express herself through music and while performing on stage. Having said that, Margarita’s typical makeup and style signature can be considered a mix of Rock N’ Roll with a bit of Gothic fashion, blending leather and lace with bold accessories such as belts and chains, always wearing black with accent colors like red, silver and gold. And, of course, her trademark blood-red lips. All those strong colors and accessories are complemented by Margarita’s endless energy when she hits the stage, being very expressive and putting her heart and soul into each song played, and by her creativity, as she simply loves experimenting with different chains, spikes, fabrics and other material when creating her stage outfit. When asked about how she prepares herself for a concert, Margarita said she tries to rest as much as possible and stay hydrated, and that she doesn’t take too long to get dressed and put on her makeup as she always knows what she’s going to wear. She also said being in a band is a lifestyle she truly loves, and although it’s not an easy one she has a lot of fun and pleasure while working on new material, creating new visual arts for the band and rehearsing, always aiming at moving forward with the band. Regarding being an artist, our red-haired muse mentioned that she’s always been determined to become an artist since her childhood in Russia, where she was surrounded by art. Her mom used to take her to theaters, concerts and ballets, inspiring her to start performing at a very young age. So far, it has been a thrilling and rewarding ride to her (despite being a very demanding way of life), with honesty, hard work and creativity being some of the most important elements in her career, not to mention her life motto which is “do it because you love it and enjoy every part of the journey, it goes by fast!’’ In addition, singing metal music in front of a huge crowd and recording vocals for Edge Of Paradise were initially a brand new experience and a challenge for her, despite her previous experience as an artist and her passion for classic voices like Dio and Freddie Mercury. Furthermore, Margarita said that coming up with melody ideas and finding her own style were very rewarding steps for her, and of course she’s always interested in evolving as a singer and as an artist in general. Last but not least, when asked about the importance of image in her life and career, and how social media has had an impact on those, she said that as we live in a digital world where everything is over saturated, social media ends up working as a double-edged sword because we have the tools to reach people, but if you don’t have the best content (both visually and musically) you won’t be able to attract people’s attention. She complemented by saying you really have to create a world that people will want to be part of, inspiring people to follow you, and therefore boosting your creative process. Well, I guess Margarita is absolutely right about that, because if you think about it, who doesn’t want to be part of the unique and whimsical world created by Edge Of Paradise? This entry was posted in Metal Chick of the Month and tagged alicia, angels de amor, armenia, audrey hepburn, break away, california, children of the sea, christmas (baby please come home), dave bates, dust to dust, edge of paradise, ghost, hard rock, houston, immortal waltz, in a dream, los angeles, margarita martirosyan, margarita monet, mask, metalholic, mistery, moscow, nashville knights, nefarious: merchant of souls, new york, new york university's tisch school of the arts, no leaf clover, perfect shade of black, rise for the fallen, robin mcauley, rock n' roll, rockers against trafficking, russia, sally's song, shade of crazy, soultone cymbals studio, still loving you, symphonic metal, texas, the high school for the performing and visual arts, top 25 women in hard rock and metal, united states, yerevan by Gustavo Scuderi. Bookmark the permalink.